So lets go over a few things. First of all you’ll notice that the conversation is in a threaded format, which is different from the traditional way of organising things in folders. In Gmail there are no folders. Everything is organised by thread (“conversation” in Gmail speak) and by label. Basically, the entire conversation shows up on screen, in expandable format. If I click any of the message titles, that email will expand inline. If I hit reply, a reply box will be appended at the bottom of the same window (as can be seen). 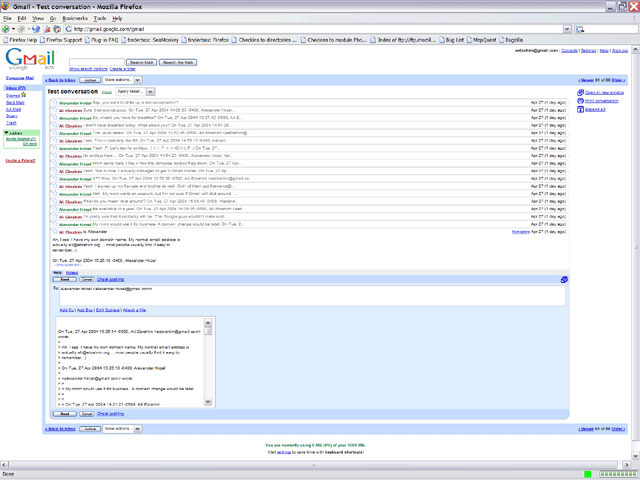 The interface is pretty slick, probably the best I’ve seen out of all the webmail interfaces. Another thing you’ll notice is the complete lack of graphics, apart from the Gmail logo and a few spacer images and the star. There are no popup or popunder ads, and there are no graphical ads at all, actually. This makes Gmail ideal for modem users who are sick of waiting for sites like Hotmail to load their numerous ads. Because of the way the interface is set up, you’ll find yourself not having to load too many pages, and the pages load very quickly because they are so small. So yeah, for modem users this is a great thing. I wish more web companies would pick up on the simple-yet-functional design ideal, instead of the lets-bomard-users-with-pretty-graphics-so-they-think-we’re-cool design ideal. At one point I was considering doing a more detailed review of Gmail, but firstly, I’m too lazy to do that, and secondly, countless people have already done the honours, so why duplicate their effort? So instead, I just made a screenshot and wrote a little bit of stuff about Gmail. If you want to find out more about Gmail, I suggest you use Google (see a theme here?) and do a search. I’ll let you be creative and figure out the search terms for yourselves. Anyway, I should probably get back to what I should be doing, which is writing a paper on what China’s foreign policy will look like in the year 2020. Isn’t that fun?